Watch animals in a desert during the day - and at night! Have you heard these nocturnal birds singing at night? See a barn owl close up and find out about the feathers around its eyes. 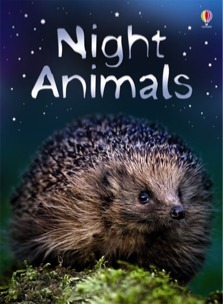 Which animals come out at night? How do they find food in the dark? Where do they go during the day? These and other questions are answered with vivid, full colour photographs on every page, and short, informative text. Includes links via Usborne Quicklinks to carefully selected websites to find out more.